Data`s android strength has given him some significant advantages over many other life forms. He is stronger, more intelligent, and more live longed than almost any other life form encountered by the Federation. His extraordinary abilities have helped to make him an exceptional Star Fleet officer. On a purely physica, level, Data`s body is superior to that of a normal humanoid. His body is constructed of TRIPOLYMER COMPOSITES, MOLYBDENUM-COBALT ALLOYS, BIOPLAST SHEETING and DURANIUM. His body is exceptionally durable, and barring accident it gives hi, a potentially indefinite life span. 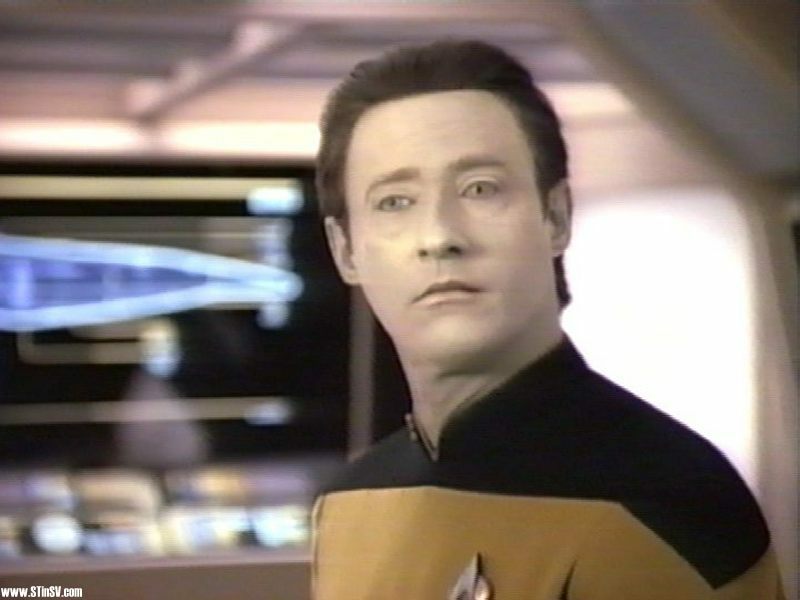 Thanks to a temporal anomoly, Data`s head is actually 200 years older than the rest of his body, it is severed in 1893 and when it is reattatched in 2369, it functions perfectly. Although Data has a pulse, and apperars to breathe, he is actually capable of living in a vacuum and of functioning in several different other environments which are hazardous to organic life-forms. This means that Data can be sent on missions that would be impossible for most Star Fleet officers. In 2366 he is sent to Tau Cygna V which is bathed in deadly HYPERONIC RADIATION, and in 2370, his android body makes him the ideal person to deal with a stray probe that has crashlanded on BARKON IV and is leaking dangerous radiation. Data does not need to eat food, though he can ingest it, and he has no need for sleep. He never feels tired or short tempered. Data is also far stronger and faster than a human being. He is strong enough to lift an adult male over his head and to effortlessly shake off a blow from Lt Commander Worf. When he is accidentally shot with an arrow, he does not sustain any significant damage and it is a simple matter for him to remove it from his chest. He can move so fast that his hands can barely be seen. Data can control his body extremely precisely. This allows him to perform several different feats with extraordinary precision. He can also duplicate any action which he sees someone else perform, and he uses this ability to learn to dance. He is the perfect pupil, all he has to do is watch his teacher, in this case Dr Crusher, and then he too can perform the same routine flawlessly. The same ability allows him to perform the VULCAN NERVE PINCH, something that few non-vulcans have managed. He can control all parts of his body with the same precision, he can even make his hair grow, or change it`s colour. He can also reproduce a persons voice accurately. Although Data may have some trouble with emotional relationships, Dr Soong was concerned to ensure that Data was as human as possible. he designed Data to be fully functional, and he is programmed in multiple sexual techniques. Since Data`s programming does not allow for laziness or carelessness, he consistently performs all procedures flawlessly, making it far less likely that he will be involved in an accident. However, Data is capable of intelligent thought and he can decide to disobey and order if he sees good reason. Perhaps Data`s most impressive abilities are related to his positronic brain. He has a memory capacity of 800 quadrillion bits and his total computational speed has been rated at 60 trillion operations per second. This is far in excess of any human being, and allows Data to make extraordinarily complex calculations at great speed. Once Data has assimilated a piece of information, he never forgets it, and he has a rapid,perfect recall. Data can perform many of the functions of the most advanced Federation computers. For example, when he is part of an away team which visits ICONIA he is able to access his massive database of information and run a program to reconstruct the Iconian language by comparing writing on a console with several known branch languages. Data`s computational abilities also ghive him an extraordinary advantage in many other areas, for instance, he is able to play SIRNA KOLRAMI, a Grand Master of STRATEGEMA to a standstill on their second match. Data`s capacity to simultaneously process a large number of thoughts at once is also extremly valuable. He is able to analyze a piece of music at the same time as he performs advanced mathematical calculations and formulates a new recipe for cat food. Data has one of the most impressive minds in the Federation. In a potential future Q shows to Captain Picard, Data has the LUCASIAN chair at CAMBRIDGE UNIVERSITY, a post that has been held by both, Sir ISAAC NEWTON and STEPHEN HAWKING. Data`s android construction also allows him to interface with other computer systems. he is able to connect directly to the U.S.S. Enterprise NCC-1701-D`s computer and control it with his positronic brain. he is also able to interface with partially machanical life forms, such as the Borg. This proves invaluable, when the crew of the Enterprise capture LOCUTUS, Data interfaces with him and communicates with Picard. When the Captain tells him how to defeat the Borg, Data is abnle to send the signal that send the Borg Collective into their regeneration cycle. Data`s positronic brain is also sensitive to a number of elements that are beyond the range of human oerceptions. Specifically he is sensitive to distortions in the DEKYON field that exists outside the boundaries of normal space time. he is subconciously able to detect interphasic life forms that cannot be detected with conventional scanners. The combination of Data`s powerful analytical abilities and his percise contrlol of his body and movements gives him exceptional artistic abilities. He can play musical instruments with perfect precision, giving a note-perfect rendition of any performance. Similarly he can creat exact replica`s of any paintings or works of art, but for many years he believes his artistic abilities are rather limited, since they merely allow him to faithfully reproduce the work of others. But this is not strictly the case, he actually synthesizes various elements of severa; artists to create his own work of art. Dr Soong programmed Data with creative abilities, and he is capable of " irrational ", creative thought processes, once he reaches a certain level of development, he even begins to dream. He has also shown considerable promise as an actor. Since 2371, Data has been equipped with an emotion chip, which allows him to experience the full range of human feelings. However, he has a unique advantage...he can turn his emotion chip off with a simple twitch of his head.